JCJ is calling for financial support for the BGreen Conference in January 2015. 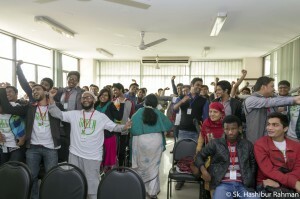 The 2014 conference was a massive success and was attended by 150 people, and successfully built community partnerships among organizations in Bangladesh. BGreen is committed to using the youth’s power and vision to the fulles t, by providing them the support to carry the project out with dedication and efficacy. Check out the BGreen Project Facebook page and website. This is a really worthwhile project to support.